When it comes to reliable commercial refrigeration, Danvers business owners trust United Service Co. Commercial refrigeration is a highly involved field, with dozens of components that must work together seamlessly to keep your food and water cold. The best way to ensure code compliance and an efficient workplace is with help from United Service Co.
We handle all refrigeration needs, from walk in coolers to ice machines. We are authorized local servicers for dozens of top refrigeration brands, and we want to help you get the most out of your equipment. Schedule refrigeration services today. The functionality of your restaurant depends on your refrigeration mechanisms. A walk in freezer breakdown could force you to close your doors for a day – making you lose business. It could also lead to thousands of dollars in spoiled food. Even your ice machines are important – no ice means unhappy customers. Safeguard your refrigeration equipment with help from United Service Co. We offer a comprehensive preventative maintenance program business owners use to have peace of mind about the functionality of important equipment. Component checks. Our team will analyze the equipment you use for commercial refrigeration in Danvers. This might include a walk in cooler, walk in freezer, reach-in equipment, water chiller, or ice machine. We lubricate components, make minor repairs as necessary, and check for leaks or inefficiencies. Ice equipment check. Dirty ice is one of the most common citations health inspectors give to restaurants. Our maintenance team can keep your ice machine in tip-top shape to make sure you’re serving customers fresh, clean ice at all times. Overheating prevention. A common problem businesses experience with refrigeration equipment is overheating. The easiest way to avoid this issue is with routine maintenance. Quarterly maintenance can ensure refrigeration units continue cooling properly, without a reason to overheat or break down. Free inspection. When you call United Service Co. for commercial refrigeration in Danvers, you get a free inspection of your equipment. We’ll also issue you a free estimate for preventative maintenance. You can discuss your equipment with our experienced team and learn how to keep your items operating without a hitch. Learn more about preventative maintenance with United Service Co. Regular maintenance is a smart and simple way to prevent breakdowns and optimize your commercial refrigeration in Danvers. We’ll work with you to come up with the ideal maintenance schedule for your company and crew. Our team can be in and out before your doors even open for the day. Did you just open a new restaurant? Thinking about investing in new equipment for commercial refrigeration in Danvers? For all your sales, installation, and service needs, come to United Service Co. Our technicians have more than 100 years of combined experience in the industry and can help you select the ideal unit for your needs. We are authorized dealers of top brands with the ability to sell all types of high-quality refrigeration and ice-making equipment. Once you select your unit, our team can install it on your property according to your timetable. Commercial refrigeration in Danvers isn’t always a one-size-fits-all system. United Service Co. partners with U.S. Cooler to create custom walk in coolers and freezers. We can design and build small to medium walk ins for restaurants, hospitals, breweries, and other establishments. We also complete large industrial applications for major food processing plants. Our clients can design their own systems according to unique specifications and receive a unit that fulfills individual cooling or freezing requirements. Request a quote for your custom-built unit! 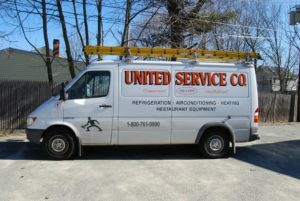 United Service Co. does much more than just commercial refrigeration in Danvers. We sell, install, and service a wide range of cooking equipment. This includes ovens, fryers, steamers, stoves, exhaust hoods, HVAC systems, and more. Our licensed and trained technicians service all kinds of gas, electric, and steam equipment according to the highest industry standards. We set the bar for quality in Massachusetts. Let our team work on your cooking and refrigeration equipment, and never deal with costly breakdowns again. Why Come to United Service Co. for Commercial Refrigeration in Danvers? At United Service Co., we know we aren’t your only choice for commercial refrigeration in Danvers. You must research your options and make a selection carefully. As a company that’s been in business for over 60 years, we know exceptional service. We continuously train and educate our technicians to understand evolving technologies and use the correct tools and techniques for each job. Our team has extensive experience handling small to large refrigeration units, and solving simple to complex equipment issues. No matter what type of service you need for your refrigeration, heating, and cooling commercial needs, come to United Service Co. Don’t take our word for it – read our testimonials. Our customers call us “responsive, “professional,” “courteous,” and “fast.” With 24/7 emergency services, quick responses to last-minute service calls, and friendly service, we are the top choice for commercial refrigeration in Danvers. Our team will quickly diagnose the problem, recommend efficient repairs or replacement, and complete the service according to your timeline. Your establishment will be up and running again in no time. Our mission at United Service Co. is to provide prompt and professional commercial services throughout New England. Our family owned company practices good old-fashioned hard work and commitment to customer service. We put the customer first, dedicating our practice to total satisfaction. With an A+ rating by the Better Business Bureau, five-star reviews, and 100% satisfaction guarantee, we’re confident in our ability to meet and exceed your expectations. Next time you need commercial services, you know who to call. As a business owner, it is your responsibility to keep your equipment running smoothly and efficiently. Otherwise, you risk losing business. With help from our friendly and knowledgeable staff, you can achieve this without breaking a sweat. Never worry about the state of your refrigeration, heating, or cooling equipment again. Let our fully trained team of technicians take care of all your needs for commercial refrigeration. Danvers residents can call (800) 761-0900 today, or get in touch online to schedule services.